A frame from the animation created by astrophotographer Damian Peach that shows how a global dust storm has overtaken Mars. Astrophotographer Damian Peach created an animation showing the dramatic effects of the global dust storm that has plunged the Martian surface deep into darkness. "I carefully matched them together to show a gradual change of the normal clear view of this hemisphere to how it appears now," Peach added. "It shows the large scale-obscuration due to airborne dust." Peach posted the image online via Twitter. The dust storm began as a localized phenomenon in late May, but it grew incredibly quickly. By the third week of June, the storm had become a planet-circling event, and it continues to rage today. That's a shame for amateur astronomers who had hoped to get a good look at Mars through their telescopes late this month, when the planet makes its closest approach to Earth since 2003. Currently, the Red Planet's features are "largely lost beneath the dust," Peach said. 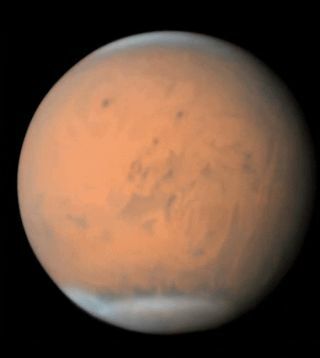 "It will take at least a couple of months from now for Mars to start to return to a normal appearance — provided further local dust storms do not develop (quite possible as we are now well into the season on Mars where dust events are common)." Astrophotographer Damian Peach created this animation, which shows how the global dust storm currently raging on Mars has obscured the planet's surface features. The dust storm is also creating issues for NASA's solar-powered Opportunity rover, which has been silent for weeks, unable to recharge its batteries. Opportunity has apparently put itself into a sort of hibernation, turning off everything but its internal clock to conserve energy, mission team members have said. The rover's handlers have expressed optimism that Opportunity will be able to ride out the dust storm, but their anxiety won't clear until the six-wheeled robot finally phones home once again. The dust storm is a nuisance rather than an existential threat to NASA's other active Mars rover, Curiosity, which is nuclear powered.